A 9-0 run late in the second half put the game on ice as Princeton beat Delano. 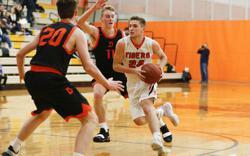 While the three-pointer seems to have overtaken nearly all levels of basketball, Tuesday’s game between Delano and Princeton came down a good old fashioned battle of the posts. The two big men – Princeton senior Jon Stimmler and Delano junior Max Otto – went toe-to-toe throughout the game. But in the end, Stimmler and Princeton got the best of Otto and Delano as a late run fueled Princeton to a 76-61 road victory over the defending Class 3A state champion. Though the schools are in different conferences and sections, there’s a hint of familiarity between the programs. Princeton coach Brett Cloutier joked about the two matching up consistently at youth tournaments. Stimmler said he was familiar with a number of players on Delano’s (0-1) roster. But that didn’t make his matchup against Otto any easier on the defensive end. While the 6-foot-7 Stimmler is built more like a traditional big man, Otto, a smaller post at 6-foot-4, kept Stimmler moving on defense. Otto’s quickness paid off as the junior, who also plays quarterback for Delano, grabbed 11 rebounds to go along with eight points. While Stimmler had some challenges on the defensive end for Princeton (2-0), he exploited the height difference on offense, especially in the second half. 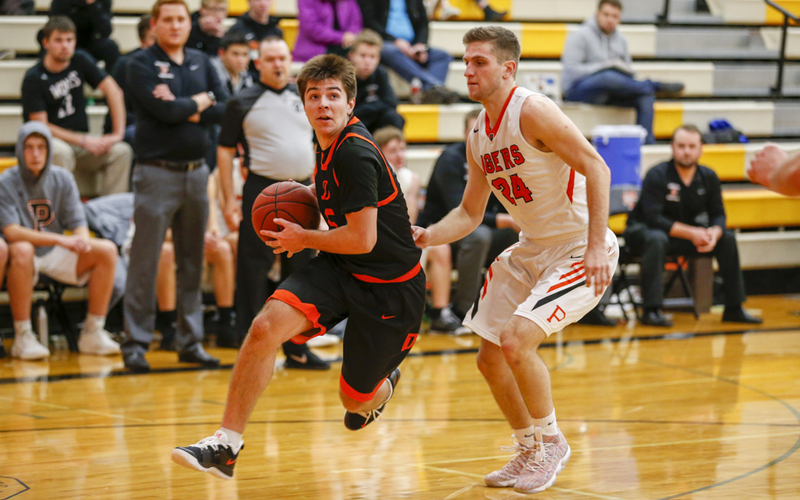 After an eight-point first half, Stimmler exploded for 14 points in the second half to help Princeton keep pace with Derek Techam’s 23 points for Delano. The majority of Stimmler’s big second half came near the end as Princeton, ranked No. 2 in Class 3A by Minnesota Basketball News, pulled away. With Princeton holding a 61-59 lead in the second half, the visiting Tigers finished the game on a 15-2 run, including a 9-0 stretch that gave them some breathing room. 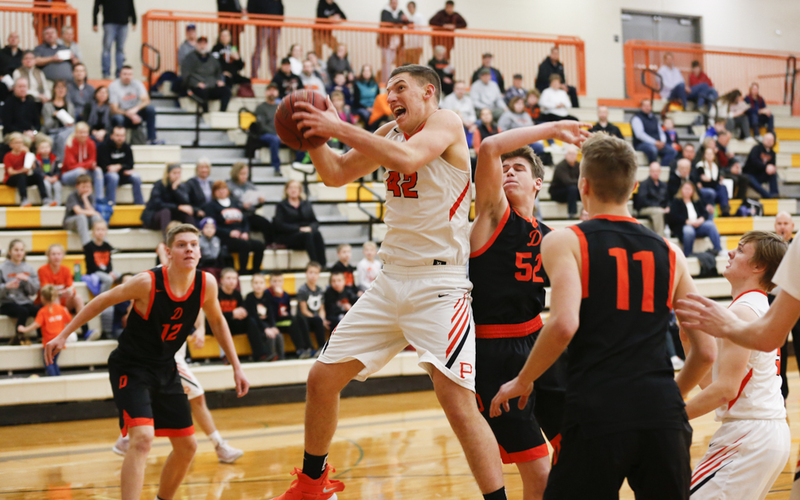 After last year’s 86-83 loss in the Section 7 semifinals to Cloquet, Princeton came into this season as a favorite to win it all with key players like Stimmler returning. After two games, Cloutier believes his team can do something similar to what No. 9-3A Delano did a season ago. In only its second game of the season, Princeton found itself in a dogfight against defending Class 3A state champion Delano. 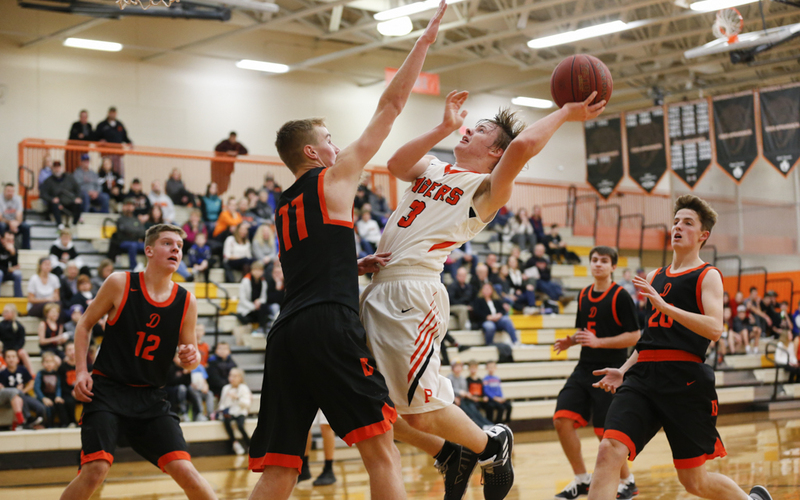 Princeton (2-0) emerged as the top dog, going on a 9-0 run late in the second half to defeat Delano 76-61 on Tuesday night at Delano High School. The teams traded the lead throughout most of the game until late. Senior center Jon Stimmler was key down the stretch for Princeton, which is ranked No. 2 in Class 3A by Minnesota Basketball News. He tallied 22 points, 14 of which came in the second half. Stimmler also had 12 rebounds. Princeton (2-0) received key contributions from senior guards James Flicek and Adam Williams, who each had 18 points. No. 9-3A Delano (0-1) struggled down the stretch despite 23 points from senior guard Derek Techam. Junior guard Max Otto added eight points and 11 rebounds.